During the American Association for Cancer Research Annual Meeting held last month in Philadelphia, 30 patient advocates—many of them cancer survivors—took part in the AACR’s Scientist↔Survivor Program (SSP) with the goal of learning about cancer science and research and incorporating that knowledge into their advocacy back home. During the program, now in its 17th year, advocates were joined by scientific and advocate mentors who guided them through a comprehensive five-day schedule, which included attending special interest sessions and preparing presentations on aspects of cancer medicine. This year’s topics were big data, cancer biomarkers, genome sequencing, cancer complexity, and immunotherapy. 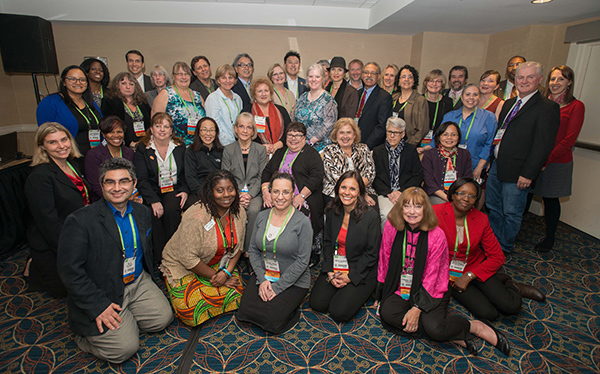 Participants in this year’s SSP during the AACR Annual Meeting 2015 pose for a group photo. Peter Kuhn, PhD, a physicist and director of the Kuhn Lab at the University of Southern California, discussed how identifying circulating tumor cells in the blood can potentially lead to earlier and less invasive diagnoses. Carolyn Compton, MD, PhD, a pathologist who teaches medical students at Arizona State University and the Mayo Clinic, presented a mini-medical school session that focused on the fundamentals of cancer and treatment. Drew Pardoll, MD, PhD, director of cancer immunology at the Johns Hopkins Kimmel Cancer Center in Baltimore, shared his 30-year journey to find effective cancer treatments in immunotherapy. Gastrointestinal oncologist Emil Lou, MD, PhD; oncologist and translational scientist Wafik El-Deiry, MD, PhD; and cancer survivor, blogger, and advocate AnneMarie Ciccarella discussed the potential of social media in making connections and fostering relationships. For a full recap of SSP at the Annual Meeting, visit CancerTodayMag.org. Cover photo: SSP Chair Anna Barker, PhD, speaks to program participants at the Annual Meeting.